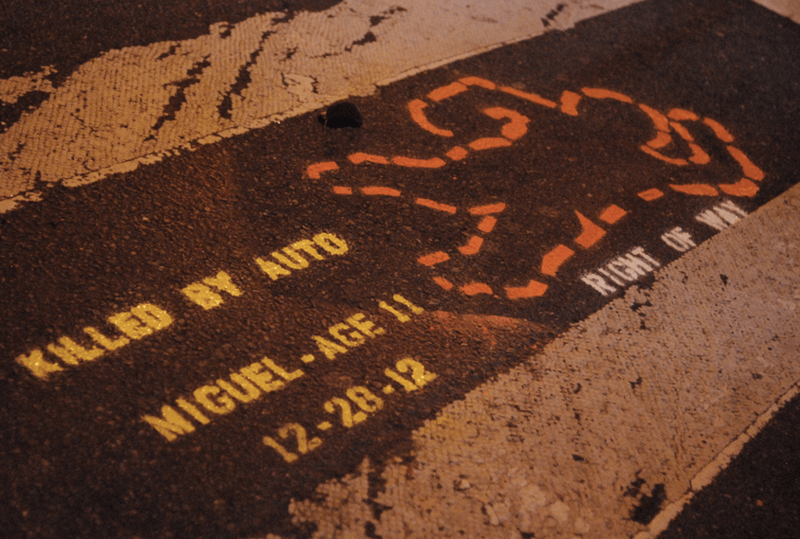 In the past two weeks, four New Yorkers have been killed by reckless drivers while walking on the sidewalk. At least one senior has been killed in the crosswalk. The victims came from every walk of life, from many different corners of the city, and ranged in age from 9 to 79. Last night in Jackson Heights, family, friends, and neighbors of people killed by drivers joined elected officials and advocates to march for justice and demand action from the city. The march covered a mile and a half along Northern Boulevard and 37th Avenue, from Corona to Jackson Heights. Along the way, the group of nearly 70 people stopped at crash sites to honor victims. The march was organized by Three Children Too Many, a Jackson Heights-based group that formed in response to the vehicular killings of young people in Queens, including Jahir Figueroa, Miguel Torres, Luis Bravo, and Allison Liao. Family members spoke about their loved ones, pleading with the city for action and asking drivers to stop engaging in reckless behavior. Amy Tam and Hsi-Pei Liao spoke movingly about their daughter Allison, 3, who was killed by a turning driver while walking in the crosswalk with her grandmother on Main Street in Flushing. Bravo’s mother does not speak English, so Lee has been acting as the intermediary between her and the police, who have still not caught Bravo’s killer. “I tried to talk with a detective on the case,” Lee said, “but he just told me basically if they haven’t caught the guy who did it after a week, then it’s going to be really hard to track down the person.” Lee has not heard anything from the detective in about three weeks and is planning to return to the 108th Precinct with Bravo’s mother to make sure NYPD hasn’t given up on the case. In addition to Peralta, Assembly Member Francisco Moya, Public Advocate-elect Letitia James and Council Member Julissa Ferreras spoke during the march. Ferreras said that when she was fifteen, two of her friends died after being hit by a drunk driver on Northern Boulevard. “I don’t want to hold any more vigils. I don’t want to go to any more funerals,” she said. Ferreras said the city must change its default position on traffic safety by not waiting until an intersection is proven dangerous before it qualifies for traffic calming. “We’re building all these new schools — speed bumps should come automatically with the package. We shouldn’t have to request one after a kid is hit,” she said. Cristina Furlong, a Jackson Heights mother and organizer of Three Children Too Many, said she is planning a forum in January to maintain pressure on the city for action. Similar events are being planned in Park Slope and Fort Greene. There are too many funerals for children killed by drivers on Northern Boulevard.